According to White's Directory of 1836, Great Witchingham established a small workhouse in 1757 on the common which was enclosed in 1815 and 26 acres allotted to the poor. William Batson was the workhouse governor in 1835. The site is, on Common Lane at the west of Lenwade, is now occupied by Rose Cottage. The parish of Horstead had a poorhouse on Church Close in Horstead. 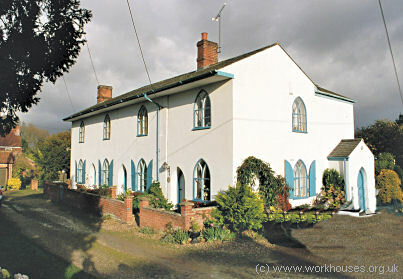 Horstead former parish workhouse, 2005. In 1805, St Faith's became one of the Norfolk Gilbert Unions established under Gilbert's Act of 1782. The other member parishes were Catton, Crostwick, Drayton, Felthorpe, Haynford, Horsham & Newton St Faith, Horsford, Horstead-with-Stanninghall, Rackheath, Salhouse, Spixworth, Sprowston, and Taverham. A union workhouse for the elderly, infirm, and children was erected soon afterwards at Horsham St Faith. County of Norfolk: Alderford, Attlebridge, Beeston St Andrew, Booton, Brandiston, Catton, Crostwick, Drayton, Felthorpe, Frettenham, Hainford, Haveringland, Hellesdon, Honingham, Horsford, Horsham St Faith and Newton St Faith (2), Horstead with Stanninghall, Morton-on-the-Hill, Norwich Trinity or St Mary in the Marsh (2), Rackheath, Ringland, Salhouse, Spixworth, Sprowston (2), Swannington, Taverham, Weston Longville, Great Witchingham, Little Witchingham, Wroxham. The population falling within the Union at the 1831 census had been 11,126 with parishes ranging in size from Alderford (population 40) to Sprowston (1,279). The average annual poor-rate expenditure for the period 1833-35 had been £10,833 or 18s.3d. per head of the population. The new St Faith's Union decided not to build a new workhouse, instead preferring to retain the existing St Faith's Gilbert Union building which was said to be "rat-infested, overcrowded and inadequate"(Digby, 1978) The Poor Law Commissioners authorised an expenditure of £800 for enlarging and adapting the building for use by the Union. The workhouse location and layout are shown on the 1905 map below. 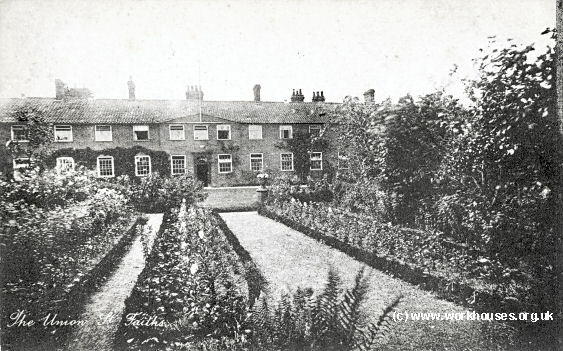 St Faith's workhouse site, c.1910. St Faith's workhouse site, c.1929. The picture below shows workhouse inmates carrying out a fire practice drill, something that was to prove its value a few years later. 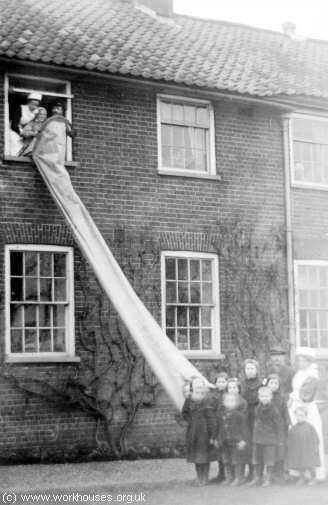 St Faith's workhouse fire practice, date unknown. In the early hours of Monday 19th June, 1922, a fire devastated the workhouse. Below are some press reports following the event, kindly contributed by Carol Richmond. The extracts and picture come from the Norfolk News and Weekly Press issues of June 24th, 1st July 1922, 2nd September 1922 and 28th October 1922. St Faith's fire-damaged workhouse, June 1922. St. 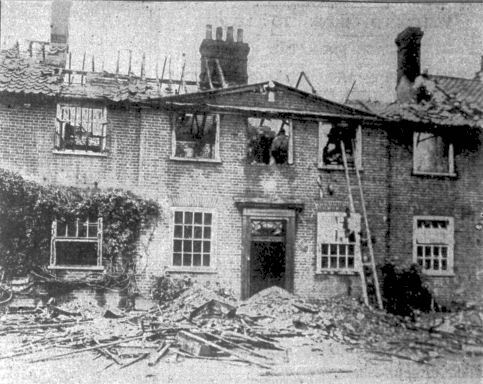 Faith's Poor Law Institution, described as the most unpretentious building of its kind in the county, standing well back from the main road on the Aylsham side of the village, was partially destroyed by fire in the early hours of Monday, 19th June 1922. At the time, the building housed some forty-nine inmates, although none were injured. Considerable damage was done to the front part of the House, with the Master, Matron and Nurse losing all their belongings. The night attendant, Mrs. Dorcas Savage, told how she came on duty at 9.30 p.m. on Sunday night. She carried out periodic inspections of the wards and while passing along the corridor from the mens' to the old ladies' infirm ward, at about 4.40 a.m., she smelt burning to the rear of the nurses' bedroom. On going downstairs she saw smoke coming from of the Master's sitting room on the ground floor at the rear of the front block. On opening the door, she was horrified to find the room like a blazing furnace and banging the door to, she had the presence of mind to rush upstairs and warn the Master and Matron (Mr. & Mrs. H.D. Bowman). Afterwards, Mrs. Savage made preparations for the rescue of the bedridden old people who occupied wards on either side of the front door. Mr. Bowman described how he dashed down-stairs, disregarding the fact he was in his night attire. He obtained a fire extinguisher and attempted to use this on the flames, but the fire had such a hold, all he got for his pains was the partial loss of his eyebrows, moustache and hair! Wearing only his trousers, he mounted his bicycle and rode to the Post Office and asked them to telephone the Norwich Fire Brigade. He then assembled the villagers. In the course of his rushing about, his bare feet were badly cut by glass and splinters of stone. In a very quick time, officials and men of the village got to work to get the old people, who could not help themselves, from the burning building. The flames by this time had spread at an alarming rate. Ladders were secured and by this means, the elderly were lowered from the upper room windows in slings made of blankets, with other helpers underneath in case of accident. Within 15 minutes of the telephone call, the Norwich Fire Brigade arrived with motor pump and appliances. Two lines of hose were used, taking water from the river 1500 feet away. Within an hour, the Brigade had the blaze under control and were confining it to the centre block, which measured about 30 by 35 feet. This block was almost completely burnt away, with the centre roof consumed. Extensive damage by heat was suffered by the rest of the building, which measures about 250 feet long. Several of those helping with the rescue were mentioned for their services - with a thorough disregard for their own safety. Particularly commended were the porter, John Ruse, Mr. A.J. Pollard, Mr. Richard Goodson and Mr. Sidney Pumphrey, and Police Sergeant Cooper and Police Sergeant Durrant of the County Constabulary. The inmates were removed, later that day, to another Infirmary in the county, and on the following day were re-housed at the Aylsham House. The building was described as being built in 1805 and situated in inviting surroundings, partially screened from the road by trees and bushes, although itself it was not a particularly attractive edifice. The building was composed of structures forming a square with a court (or what the inmates called the pumpyard) in the centre. Brick was the principle building material used in the outer shell, with lathe and plaster infill. The building was insured by the Guardians to the extent of £5000 with the Norwich Union. A special meeting of the St. Faith's Board of Guardians met on Monday, 26th June 1922 to discuss the future of the building. Mr. B.B. Morgan was retained by the Board as an assessor in respect of insurance. The Chairman of the Board of Guardians, Mr. W. W. Cook, recalled he had been involved with the building for the past forty years and although he had an affection for it, he described it as inadequate and old-fashioned. He also described the narrow stairs as nothing short of a death trap! It was recognised that the house and grounds were a valuable property. Arrangements were made for the inmates to be cared at the Aylsham Union at a cost of 21s.3d. per head. As they had lost all their property, the Board voted for the Master and Matron to receive £20 and the nurse £15, for the loss of their belongings. The Clerk to the Board said that the lease notice term was 12 months from Michaelmas 1922. Mr. Spurrell announced he was in the unenviable position of not only being a member of the Board, but also landlord of the buildings. Various discussions took place about the future of the Workhouse during the summer. A report of 2nd September 1922 describes a meeting of the Workhouse Board following a letter sent to Mr. J.T. Spurrell, owner of the Workhouse, asking him to release the Guardians as tenants as from October. Mr. Spurrell described conversations with his Solicitor and he was sure the Board would understand he could not agree to anything which would bring him any pecuniary loss. He described that some £2000 (or a little more) had been received from the Norwich Union Fire Office and this had not been expended and placed on deposit. Whatever use the house was to be put to, it would be useless to repair the damage until one had seen what purposes it would be required for. Another matter was the necessity of some final settlement with regard to premises which were included in the lease though not actually in general use by the Guardians (which were used for military purposes during the war). A sum of £252 was finally arrived at, which the military had to pay and that sum had not been expended, but put into the Common Fund. On more than one occasion he had raised this with the Board. The damage was done over three years ago when hundreds of panes of glass were knocked out and the weather having got in the damage had been greatly increased. He also said the garden was now going to rack and ruin. Both sides of the issue were discussed at length. Mr. Spurrell's point of view was that he would lose the rent and he was entitled to some pecuniary arrangement on that account. From the Guardians standpoint, if they had to carry out the lease conditions and had to put and leave the place in good order it would be costly. Mr. Spurrell was willing to take over the lease from the Guardians on certain terms, which he did not think were unfair. He suggested the insurance money should be handed to him and to meet the extra cost which it would take to put the place in order, an additional £1000 should be paid to him. Finally, in October Mr. Spurrell made his last offer of £2650 for release from the lease, which was accepted by the Guardians. Because of extent of the damage, it appears that the building was never repaired or reopened. The site was sold and was subsequently turned over for use as a crematorium. Norfolk Record Office, The Archive Centre, Martineau Lane, Norwich NR1 2DQ. Holdings include: Guardians' minute books (1805-1930); Births (1914-22); etc.